At our Mazda service centre in Montréal, we work hard every day to fully satisfy our customers. Book an appointment today for routine Mazda maintenance, a repair or even a car wash, and our certified professionals will do the job right, worry-free. 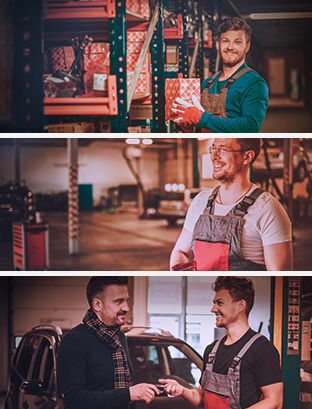 Did you know that all technicians and staff at Spinelli Mazda's service department receive exclusive training from Mazda in order to better know your Mazda3, Mazda5, Mazda CX-5 or Mazda CX-9 and serve you properly? You won't find that anywhere else but at Spinelli. We put our knowledge at your disposal every day. Also, take advantage of our free and rapid shuttle service when you leave your car at our location. We will take you back home or to the office and will drive you back to the dealership as soon as your car is ready to go. We aim to please as many customers as possible, so we extended normal service hours to serve you better. This way, you are sure to find a convenient time to get maintenance done on your Mazda. Contact our service department at 1-844-726-2827 and book an appointment for a time that's right for you. We also offer one of the largest inventories of Mazda parts in Montréal.